"Colney Heath is now well and truly twinned with Europe after a "friendly invasion" by French visitors at the weekend. Councillors and villagers welcomed a trio of representatives from Boissy-Sous-St Yon, the parish's official twin town, on Thursday. The partnership was officially sealed on Friday evening when a mutual declaration of friendship was signed by both parties at the Charles Morris Hall, Tittenhanger. Signing for Colney Heath was the chairman of the village's twinning association, Mr Dudley wood, and secretary Mrs Heidi Waters. Adding their names for the French were Madame Martine Vigneron and Monsieur Claude Cherdo. The imposing documents, one for each party, had been scripted the week before by Mrs Waters and framed in Boxwood, the native tree of the Boissy region. Also present at the ceremony were members of the Colney Heath Parish Council and the Mayor of St Albans, Councillor Ken Jenkins. With the third member of the French party local councillor Monsieur Michel Gabilon, the visitors were shown around the parish and sights of St Albans and on Saturday they watched Colney Heath Football Club beat De Havilland's XI 3-1. That evening at Colney Heath school, more than 100 guests attended a cheese and wine buffet which featured an impromptu performance by M. Gabilan, an amateur singer, and an old-fashioned "knees-up" with the Mayor of St Albans, his wife, Mrs Jo Jenkins, and parish council chairman, Mrs Mary Cooper. Madame Vigneron, speaking for the group, said they were surprised by the interest their visit had generated. "We had not expected such a large number of people would attend tonight's party," she said. In every other respect Colney Heath has lived up to expectations, she said. "It is exactly as I imagined it," she added. The visitors travelled home on Sunday morning after staying at the homes of the Howard and Dyson families in the village. Afterwards, Mr Dudley Wood described the visit as "a great success. It was a big step towards stronger friendship with our French counterparts," he said. A party from Colney Heath is likely to visit France in June. 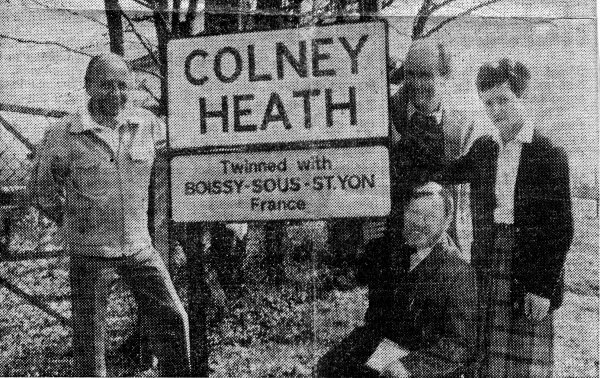 Colney Heath Town Twinning Association are holding a bring-and-buy sale on Saturday to raise cash for further links with its French counterparts. The sale, at the Village Hall, High Street, Colney Heath, begins at 2 pm."